The sun has set and never will it rise again. The beacon of hope is gone and never will it ever resurface. The tallest tree in the forest has fallen and never again will it ever wake up. The warmest fire that brought both promise and hope for a better tomorrow has been extinguished for eternity. The wings of the greatest eagle that soar the sky have been clipped, this time forever. The gigantic ship that comfortably sailed opposite the current, has sunk and this time it will never appear again. With remarkable bravery similar to the lion protecting its pride, Gednezar Dladla always fought for the rights of the community of Somkhele. It is true, leaders are born and not made by circumstances, none whatsoever. Mr Dladla was an extraordinary man who lived an ordinary life in an extraordinary manner. His dedication and determination for helping his community has never and will never be questionable. I would be richly blessed if I could inherit that mans soul. He was one of a kind. He never talked much but when he talked, wisdom would fly. I have drawn many lessons from Mr Dladla and I am not surprised that most comrades within the circle of human and environmental rights activism, knew him as my father, and I have never bothered to correct those who made that mistake and I took pride in it. I first came into contact with Mgabadeli as we would always refer to each other, in 2011 as a journalist, when he was summoned to appear before the magistrate at the Kwa-Msane Magistrates Court, after the chief of Mpukunyoni Tribal Authority laid charges against him apparently for convening a public meeting without the consent of the traditional authority which was a move to silence him but instead it fueled him even further. I recall, we clicked from that moment on until death tore us apart. After appearing twice before the magistrate, the charges were dropped and it meant victory for him and his community which came out in his support. And thus our relationship began. Mr Dladla exhibited a great amount of bravery and I saw myself adding positive value to his quest of liberating his community from the injustice imposed by the Somkhele mine, who had made promises that would alleviate poverty, but later imposed greater stress when none of those promises were kept. I couldn’t sleep for a couple of days after meeting Mgabadeli, questions bombarded me each time when I closed my eyes and the constant question was “what can I do to rectify the situation I have just witnessed”. I thought I would find answers quickly and create a win-win situation for all parties involved and that meant I had to leave my current job and take up activism, which I unceremoniously did. Four years down the line I have not gone back to journalism and film production, but journalists and film makers are coming to me and Mr Dladla for different stories as well as documentary production. All of this was done hand in hand with Mr Dladla. Mgabadeli was always, and I mean always, ready to do anything as long as it would bare fruit and give his rural community of Mtubatuba the benefit of their well resourced land without expecting anything in return. Even when he was sick he was prepared to go wherever we were needed to be. Activists are often if not always referred to as criminals especially by those who intend to exploit people simply because activists capacitate people to stand up for what rightfully belongs to them. After the four years I spent with Mr Dladla, I am now a known activist and have been labelled a criminal as well just like him, but its different for me because I am not from the affected community, but Mr Dladla was. His cultivating and grazing land was taken away. I recall one day on our way to Okhukho, a village outside Ulundi where Zululand Anthracite Colliery has been operating since when I was just a year old. Thirty years later communities are yet to benefit from that mining operation that is on their door step and of which they were fooled to give away their for. We were with David Smith the African Corresponded of The Guardian, a newspaper based in the United Kingdom, who was doing a story about communities affected by mining. He said “the reason why activists are referred too as criminals is because multinational corporations and those with whom they work with benefit in a criminal manner and forced to cover their criminal acts by calling us criminals”. That made sense like always. Even when Mgabadeli was quiet, he still made sense. That’s how gifted he was. Mgabadeli has been a pillar of strength, a source of inspiration and a water rich well of wisdom. I have disappointed Mr Dladla many a times as is inevitable in any working relationship due to operational difficulties, but he has never disappointed me, not a single time. We have traveled leaps and bounds, mountains and valleys, on extremely hot and even rainy days, all corners of the province of KwaZulu-Natal and beyond capacitating communities to stand up for what they were rightful owned, in the same process we discovered a lot of community leaders who have achieved great things in their communities. 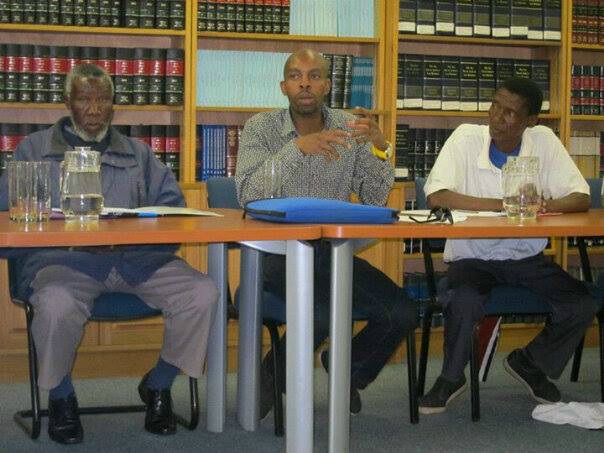 We were both at the forefront of the formation of Mining Environmental Justice Community Network of South Africa(MEJCON-SA), an NGO representing communities affected by mining across the country, at the Centre for Applied Legal Studies(CALS) at Wits, and he later became its Deputy President. Mr Dladla was part of the delegation to parliament that made oral submissions to the Portfolio Committee on Minerals and Resources about the absence of community perspectives in the Minerals Petroleum Resources Development Act (MPRDA). Mr Dladla was a firm believer that woman must be afforded the opportunity to take the lead in this struggle especially in our home province and particularly in Fuleni where a mine is being proposed without the blessing and consultation of the community, since culturally they are oppressed and unable to express their views. Mgabadeli was not only a father to his three sons Sabelo, Thubelihle and Minenhle, but he was a father to many myself included. Mr Dladla defeated all odds and if you think of a 60 year old living in the deep rural area, one is tempted not to even think a man can have Facebook and email access, but Mr Dladla was up to date with such. His passing is not only a loss to his family but to the community and the country. Mgabadeli stood for the truth and he died seeking the truth through activism. Lala kahle Mgabadeliand hope that your teachings will linger in our minds forever.